Same size. Holds more! 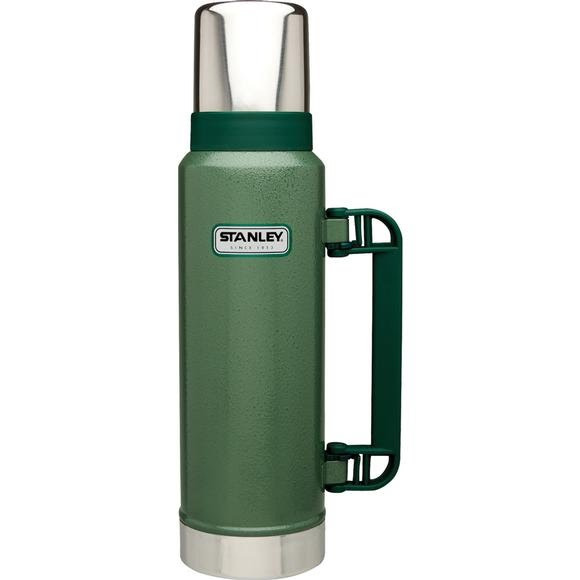 Equal in size and stature to the Stanley 1.1-quart, but with 12 extra ounces of capacity, this bottle holds a full cup more. Double wall vacuum insulation keeps coffee hot around the clock when pushing on, sleeping out or working a graveyard shift. Locking handle fits work gloves and a twist-open stopper pours at any angle. Equal in size and stature to the Stanley 1.1-quart, but with 12 extra ounces of capacity, this bottle holds a full cup more. Double wall vacuum insulation keeps coffee hot around the clock when pushing on, sleeping out or working a graveyard shift. Locking handle fits work gloves and a twist-open stopper pours at any angle. Preheat or precool your vacuum bottle by filling it with hot tap water or cold water. Let stand for five minutes. Empty bottle and immediately fill with your favorite hot or cold beverage. To clean your vacuum bottle, wash with warm water and mild detergent. Let stand for five minutes. Pour out and rinse clean with warm water. Wash with mild detergent with a soft, damp cloth or sponge and rub dry. If interior becomes stained, use a mixture of two teaspoons baking soda and warm water. Let stand open for one hour before rinsing thoroughly. To remove stubborn stains leave filled overnight with solution of warm water and baking soda with lid/stopper loosely secure for ventilation. Soaking overnight produces excellent results. To pour turn stopper one full turn to indicated arrows, assuring that stopper does not come off while pouring. Since 1913, the Stanley brand has been building durable, rugged products that last. Passed down from generation to generation, the Stanley vacuum bottle is an icon. It has survived a 4,000 foot drop from a plane, been run over by a tractor and has even stopped a bullet. Now in its 96th year, the innovation that sparked a revolution in vacuum insulation continues to grow. Today, we deliver superior food and beverage gear for rugged, active lifestyles and remain dedicated to this simple promise: Buy Stanley products, get quality gear. Built for life.